Indian gold jewelry is characterized by its traditional heavyweight and intricate designs. The craftsmanship of Indian jewelry is unmatched across the world because they can create from heavy bulky pieces to the lightest filigree designs. These of course are based on the budget, personal preference and outfit that they are to be worn with. Traditional Indian gold jewelry has come a long way in the last century and a lot of Victorian and European designs are being amalgamated with traditional Indian gold jewelry to make it more universally appealing. 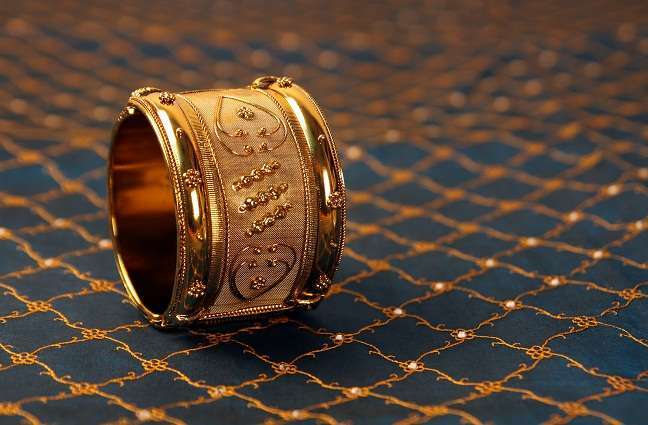 Gold is a universal symbol of prosperity, status and wealth. It is very appealing to see the fusion of contemporary European and Southeast Asian styles with traditional Indian gold jewelry. Traditional Indian gold jewelry is inspired by motives of nature and in fact is very closely incorporated with natural beauty of the gems and stones found in different areas of the country. It is commonly known that Indian gold jewelry is often built around prominent gemstones which are unique in their own right in terms of size, clarity or rarity. The precious gold is utilized in creating solid gold jewelry which has different pieces and motifs layered upon each other. The idea was to create a solid gold piece of jewelry without incorporating any other gemstones on it. The durability and economic value of gold can never be overemphasized. Indian gold jewelry is considered a stable investment and religiously it is considered a sign of affluence which brings in better luck and wealth to the owner. Each region of India has its own particular motifs and design. The Moguls were known for their use of gold as the base metal to showcase different gemstones and styles. The Southern region of India focuses on daily wear lighter Indian gold jewelry which has centerpieces inspired by nature; especially the beauty of the sea. This may include conch shells, fish as well as spiral designs reminiscent of sea weed. Apart from that the fisherman villages are known for creating jewelry that resembles the theme of the net or baskets. These are highly coveted because there’s solid gold strips rolled out and braided to create necklaces, bracelets and earrings. With the more affluent people in the city centers, gold chains and rings have become extremely popular among both men and women. However, with the evolution of machine crafting diamonds and emeralds were cut in different styles to embellish Indian gold jewelry. The amalgamation of Victorian design with Indian gold jewelry has made it more fancy but delicate. Where previously solid gold earrings and heavy gold necklaces were worn by women in India, they are increasingly being replaced by chandelier earrings and chokers studded with different semiprecious and precious gemstones. Filigree designs which were lighter and more airy in looks were increasingly popular with goldsmiths and silversmiths across India. With fashion taking on a contemporary feel in India the Indian gold jewelry is also keeping pace with modern times.